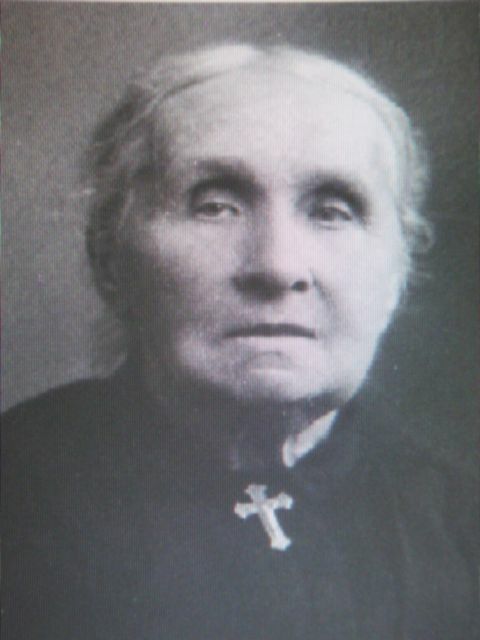 On Wednesday, June 27, 1877, Justyna Szafrynska was coming home from church with her mother, having just passed the Catechism exam. Just as the evening church bell rang, the Holy Mother appeared between two withered boughs. She had long hair. 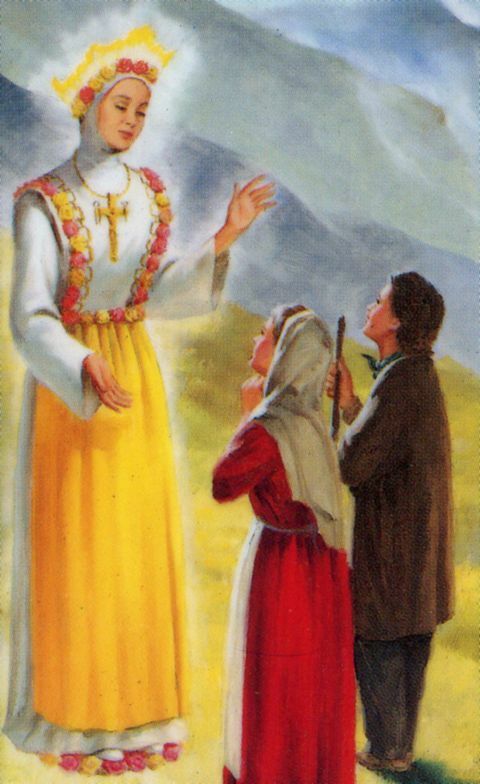 The Child Jesus descended from Heaven in white-yellow clothing and came to rest on the left side of his mother, Mary. The second apparition occurred on June 28th to two girls, Justyna Szafrynska and Barbara Samulowska. 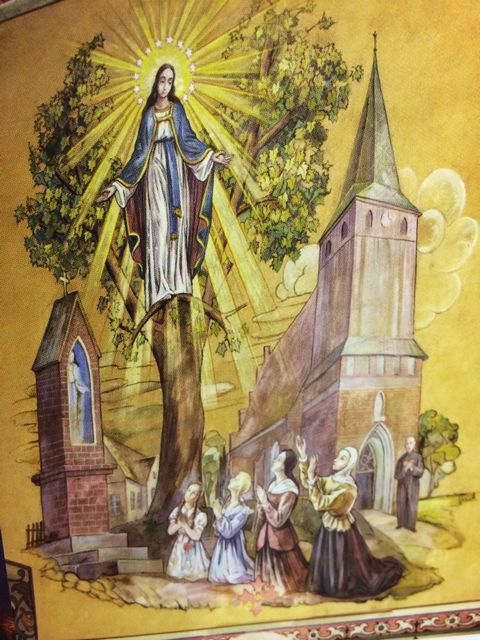 The “beautiful lady” appeared above a maple tree near the church, sitting on a throne with the Child Jesus and surrounded by angels. Jesus held a brilliant ball with a small cross at the top. 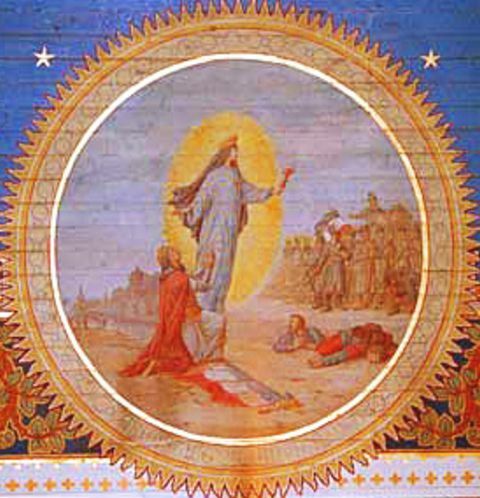 Mary was crowned by the angels. The fifth visit happened on July 3rd. The girls asked Mary if sick people would be healed. 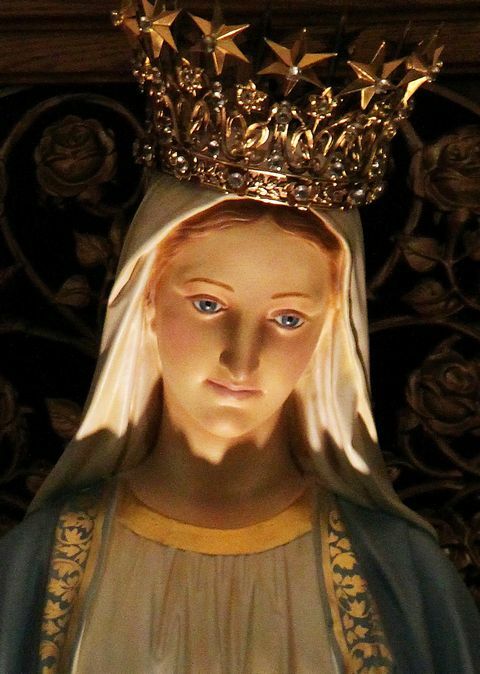 Mary indicated that a miracle would happen, and, after that, sick people would be healed. 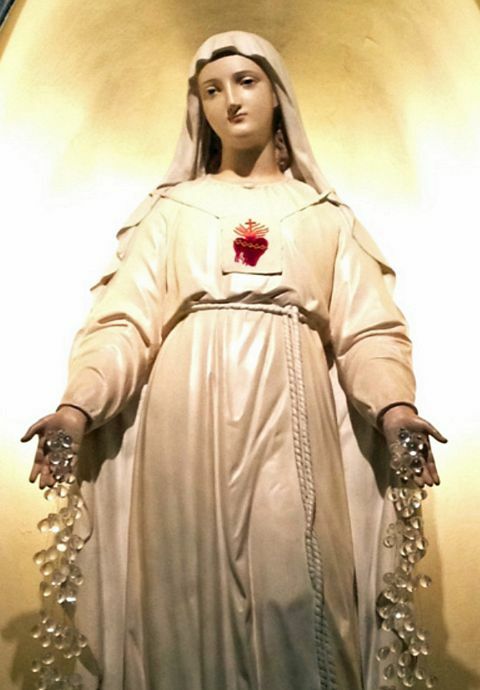 Mary implored for sick people to pray the Rosary. On July 28th the girls asked her about swearing falsely. 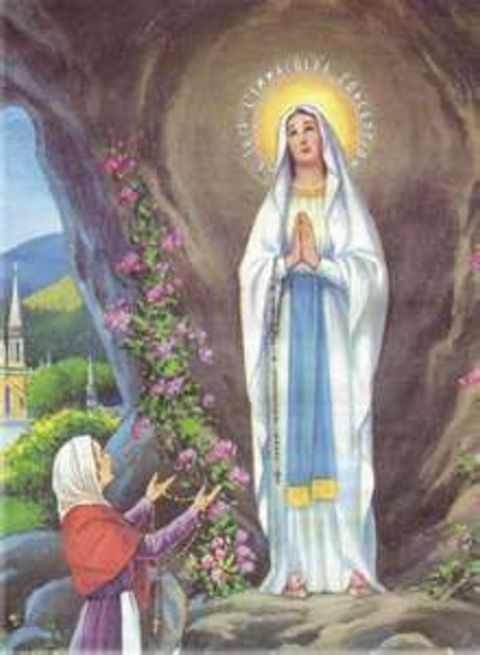 Mary replied that Satan induces those to do this, and that such a person does not deserve to go to Heaven. The seventh visit was on August 1st. 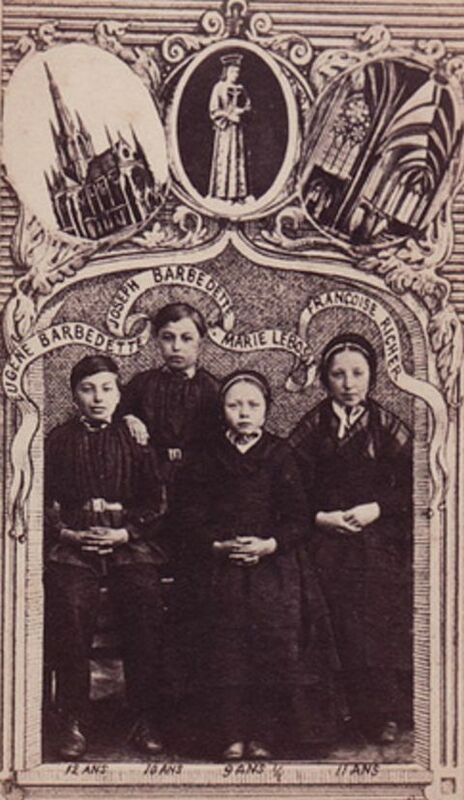 Barbara asked about when the “orphaned parishes” might be receiving priests. 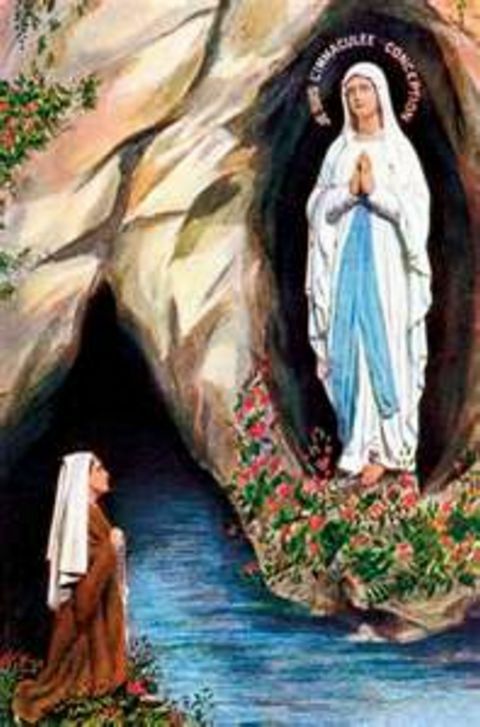 Mary said that zealous prayers will help. 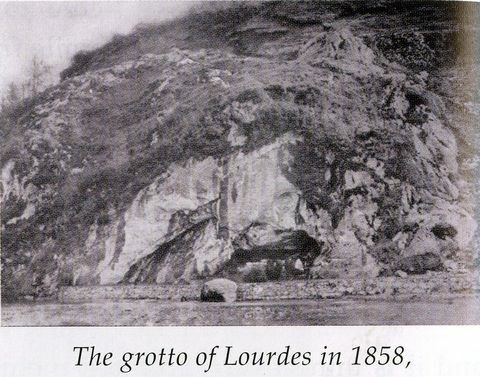 The ninth and last apparition took place on September 16th, 1877. 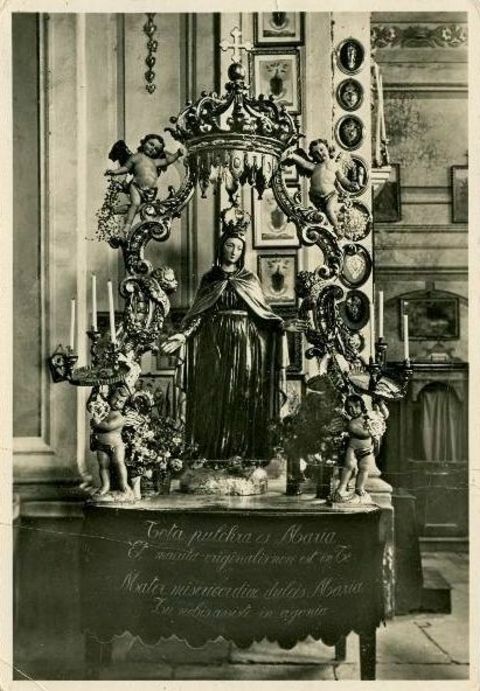 At 5:00 p.m. Mary blessed a statue of herself in a small chapel. After that she blessed all the people who asked for it. 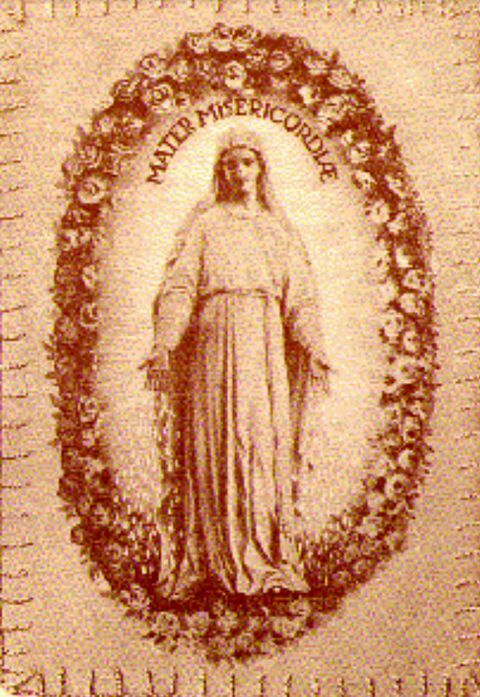 These apparitions were fully approved by the Holy See a hundred years later in 1977. The Brice family emigrated from Belgium to the United States on July 23, 1855. On August 7, 1855, Lambert and Marie Brice purchased 240 acres of land in the Red River, Wisconsin region to establish their family farm. Daughter Adele would walk the 11 miles by herself to the nearest church every Sunday. Adele Brice encounters a ghost-like, glowing lady in the woods in 1859. 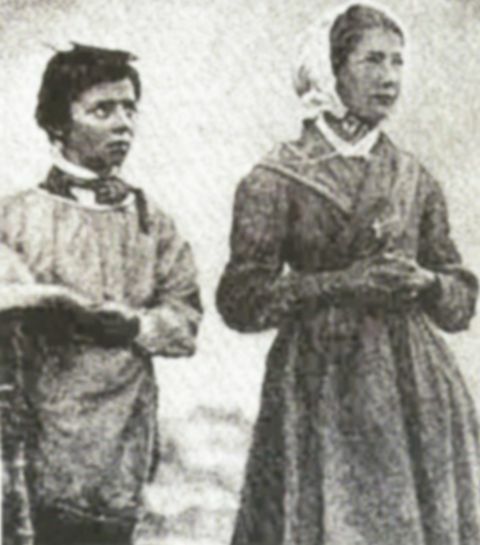 On October 9, 1859, Adele, her sister Isabelle (age 24), and their good friend, Mrs. Theresa Vander Niessen, were walking the eleven miles together to the Sunday Mass at the nearest church in Bay Settlement. As the three women approached the spot where the two trees stood, Adele again saw the lady in white. She got excited and told her sister what she was seeing. Adele froze, staring at the woman, but the other two could see nothing. But they could see that Adele was indeed staring at something, and they could see fear in her eyes. Then the lady disappeared, and they all agreed to pray for the “poor soul.” Adele confessed to the priest what she had seen, and he spoke to her about the matter, suggesting that she ask the lady who she is and what she wants. 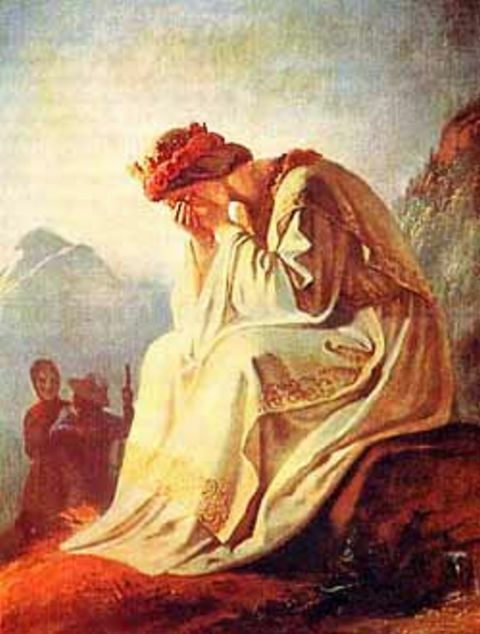 Adele felt comforted and believed by Father Verhoeff. On the way home the three women were joined by a man who was clearing the land for the Holy Cross Fathers. When they came to the place with the two trees, Adele stopped because she saw the lady again. She could clearly see that she was dressed in a white gown which fell to her feet in graceful folds. There was a yellow sash around her waist. Long wavy golden hair fell loosely over her shoulders. 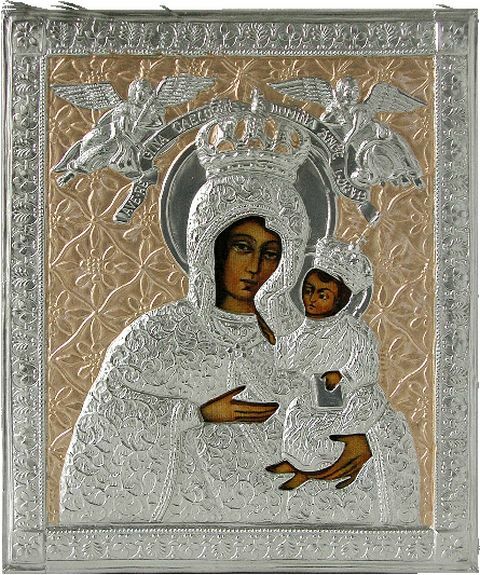 On her head was a crown of twelve stars. The bright light surrounding her made it difficult for Adele to look at her for very long. Adele saw that the lady had a very sweet, gentle face. Surprisingly, she felt no fear this time. Instead, she was completely filled with joy and peace. She walked closer and fell to her knees before her. Promising to teach children about religion, Adele keeps her vow to the Virgin. 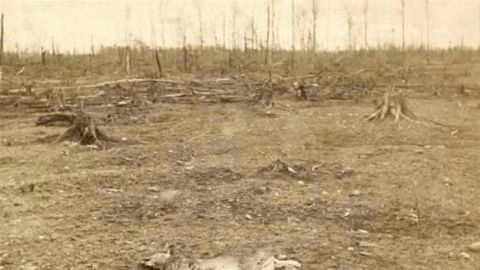 A horrible fire breaks out in 1871, enhanced by tornado-like winds. 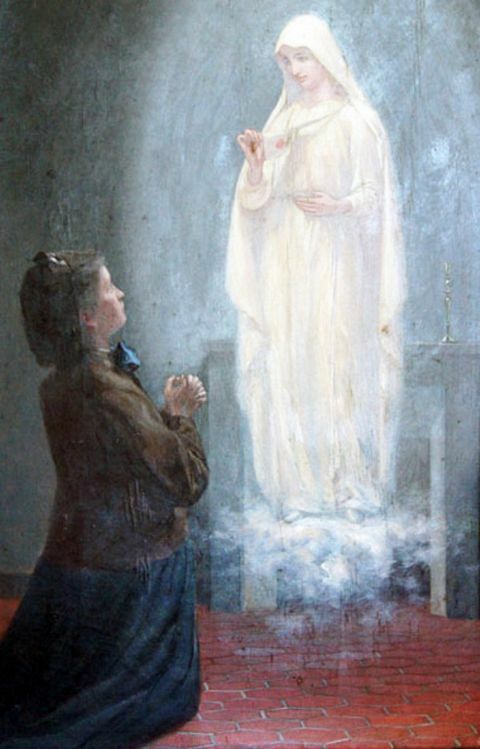 With that said, the Blessed Mary raised her eyes and hands toward heaven and slowly rose upward. She was surrounded by a light smoke-like incense. She looked like she was asking for a blessing for all of those kneeling before her. Adele, overwhelmed with emotion, collapsed to the ground in exhaustion. The man brought a cloth, soaked from a nearby stream, to help revive her from unconsciousness. Then the four walked home, and Adele told everyone about her encounter. Because of her character, most people believed her words. Her father had always believed her because she had always been a truthful girl. 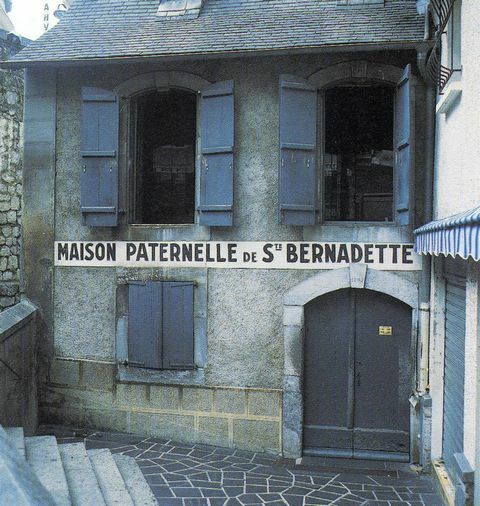 To show his support for his daughter and his love for the Virgin Mary, he decided to honor the location of the apparitions with the building of a very small chapel (10 feet x 12 feet) on that very spot. 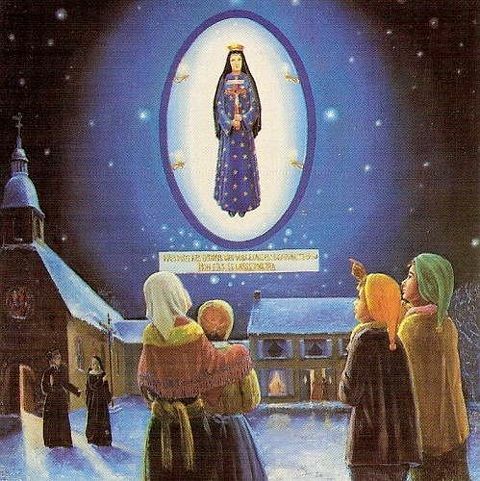 Father Verhoeff gave Adele a picture of Mary to hang there. Adele offered to work hard for the busy pioneer families if they would let her teach their children the catechism and the rosary in spare moments. She did so for seven years, bringing each child that was ready to Father Daems in Bay Settlement to test their knowledge before each one’s First Communion. In 1861, the community built a larger chapel (24 feet x 24 feet) that could hold a hundred people – and often did. 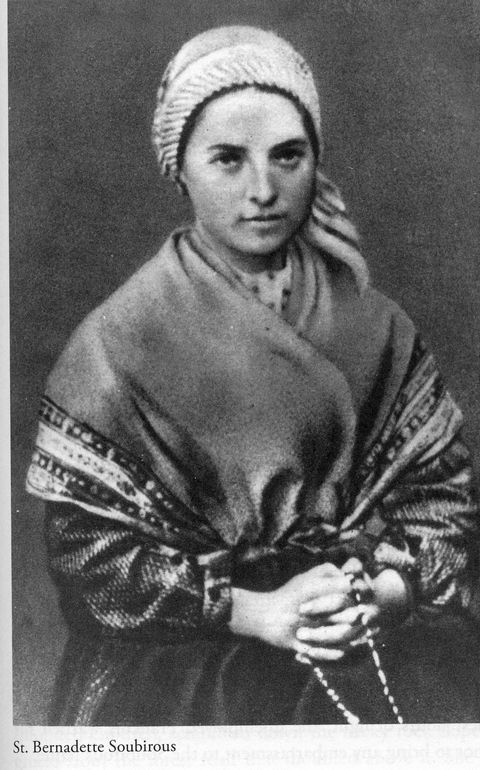 Mrs. Isabella Boyer donated the five acres that contained the holy site. Sister Adele Brice leads a night-long praying of the Rosary, pleading for heavenly help. When doubters began to give Adele a hard time, miracle healings began occurring in the chapel when Adele asked for divine assistance. Blind visitors regained their sight, deaf people regained their hearing, the desperately sick were healed, and cripples would walk again, leaving their canes and crutches behind as evidence. Word spread across the Midwest of these divine healings near Robinsonville (later called Champion). Adele acquired a beautiful, hand-carved statue of Mary from Belgium, and there was a glorious procession from the boat to its final resting spot in the chapel. However, some time later, the statue was severely damaged when it caught fire from candles placed too close to it. But farmers and other settlers took up a collection to replace it with a new statue. 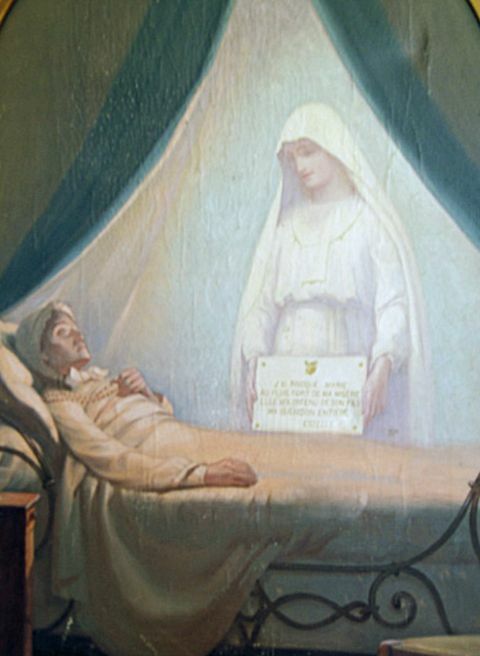 In 1864 Adele and the other religious women helping her became the Sisters of Good Health – and were accepted by the Bishop of Green Bay. In 1867, Adele opened a school next to the chapel and a boarding school, the St. Mary’s Academy, in 1869. Devastation is everywhere the next day (actual photo). 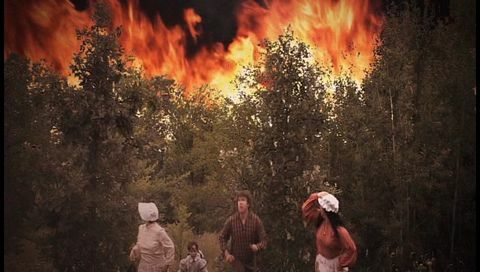 On Sunday, October 8, 1871, a most deadly fire was created by a gale force wind that turned the prairies and forests of Wisconsin into a raging inferno. Fire tornadoes ripped through the area causing death and destruction everywhere. Flames jumped rivers, embers rained down, and small fires were whipped up into a giant fireball that destroyed homes, buildings, farms, factories, and entire towns. It was described as “a wall of flame a mile high, five miles wide, traveling 90-100 m.p.h., hotter than a crematorium, turning sand into glass.” The heat was so strong that it killed people before the fire ever got to them. Approximately 2,500 people died, 12 towns destroyed, and 1.2 million acres devastated – the deadliest fire in American history. The ground was burned to a depth of two feet deep in some places. Hiding in brick homes or underground basements did not help. Only those hiding in rivers had the best chance of survival. Father Pernin of a local church made every effort to save the tabernacle from his church, but at the river his cart dumped, and it floated away as he watched helplessly. Many people lined the river banks, but the only ones who survived were those who jumped in the water with Father Pernin. Three days later, among the blackened terrain and black ashes of everything destroyed, a pristine white tabernacle was discovered sitting upright on a log in the river. Its contents were unharmed from water or heat, and the people saw it as a miracle and a sign of hope. Only Mary’s five acres remains green and untouched by the disaster; all there lived. 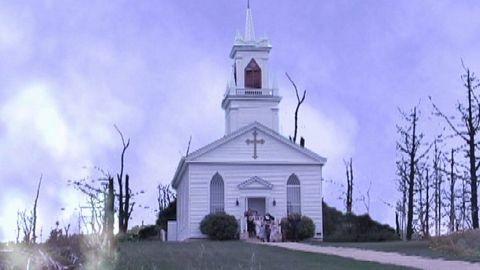 Sister Adele decided it was impossible to flee the fire, so the sisters, the school children, and frantic neighbors gathered in the chapel on the five-acre grounds and prayed to Mary for help. Then Adele led a procession around the perimeter of the chapel grounds, carrying a statue of Mary. The procession continued all night, praying the Rosary, all around the grounds. 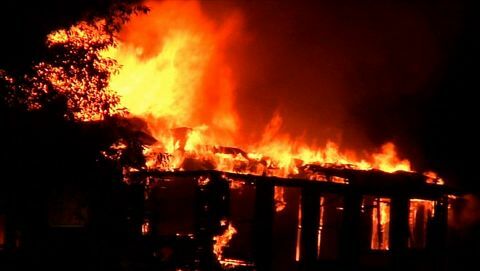 Everyone believed a miracle had occurred: the wind cooled, a heavy downpour drenched the fires, but this was long after the fires had stopped right at the fence line surrounding the five acres. The outer side of the fence posts were charred while the inside was untouched. Everything surrounding their five acres, including the lush green forest, farm buildings, and homes were blackened, obliterated, and gone. Only the people and animals that had come to these grounds survived. 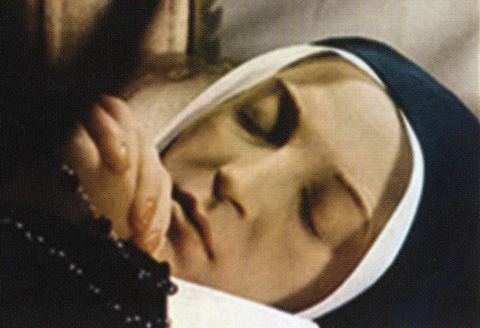 The five-acre grounds that had been dedicated to Mary were green and untouched – “a glorious sight.” Exhausted from their fears and night-long processions of prayers, the people praised God and retired to sleep. Twelve years ago, on this exact day, Mary had warned of a potential punishment. 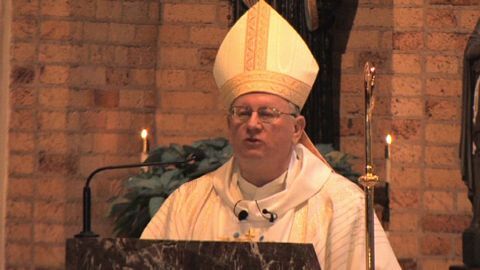 he Bishop of Green Bay approves these apparitions in 2010. Another miracle on the chapel grounds had to do with the chapel well. The weather had been extremely dry all summer with the deepest of wells in the region barely containing any water left. The chapel well was only a few feet deep, and yet it was always providing plenty of water. All the neighbors, their surviving livestock which they had brought to the grounds, and everyone else living on Mary’s five acres had plenty of water from this shallow well. There was no explanation or logic for this small well to serve so many for so long under the dry conditions. People started taking some of the well water home as it was believed to have led to some healing miracles. Many other miracles were documented. A seventeen year-old boy developed pleurisy from double-pneumonia. Despite his lungs becoming extremely weak, he said a novena at the chapel, and he was completely healed. Another boy, Michael Fonde, age nine, fell from a barn and was crippled. Four years later, a group of women prayed a novena with him at the chapel, and he walked out healed, leaving his crutches behind. A little girl with bleeding sores, who had been treated by doctors for years, was completely healed after she and her Mom made the pilgrimage to this chapel. Another small girl had become blind from a severe case of measles. When her mother brought her to this chapel to pray, she was instantaneously healed. And a deaf boy brought by his Mom to the chapel completely regained his hearing. 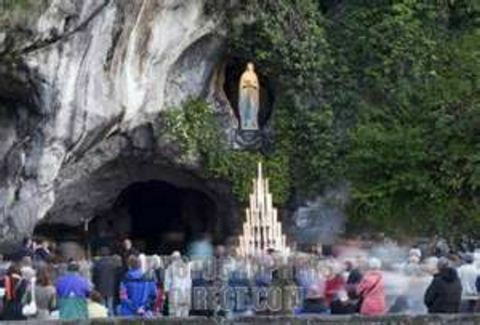 A statue of Mary gazes at pilgrims on the site; many healings occur. 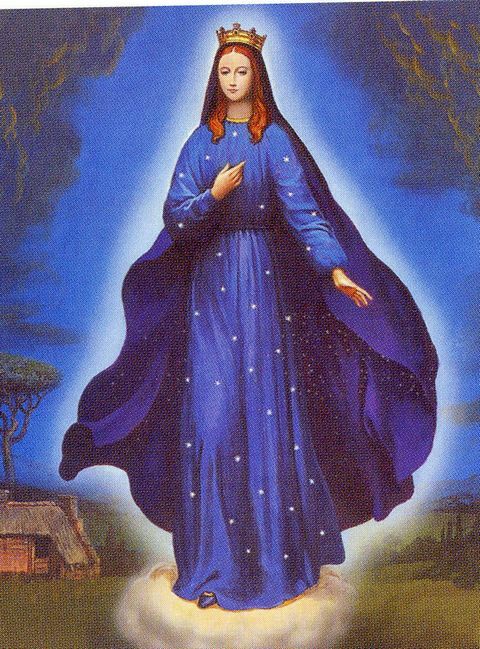 This becomes the first approved Marian apparition in the United States of America. An Austrian Jew named Alphonse Ratisbonne was the youngest son of an important banking family in Strasbourg. Alphonse was a Jew by race and religion and was very well off in material possessions. 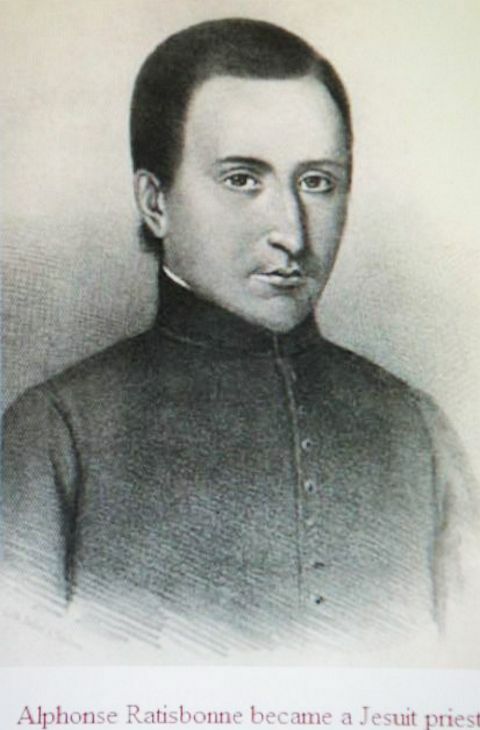 He harbored a great hatred for Catholics and anything to do with the Catholic Church – largely due to his brother George converting and becoming a priest. He blamed the Catholic Church for “bewitching” his brother. A series of mishaps brought him to Rome, a city he had vowed to never visit. 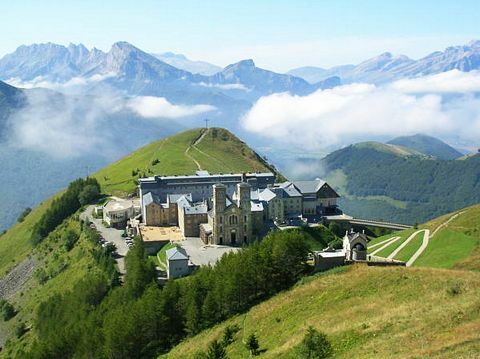 He became acquainted there with Baron Theodore de Bussieres, a very fervent Catholic. The Baron and a close circle of aristocratic friends increased their prayers for the skeptical Jew. 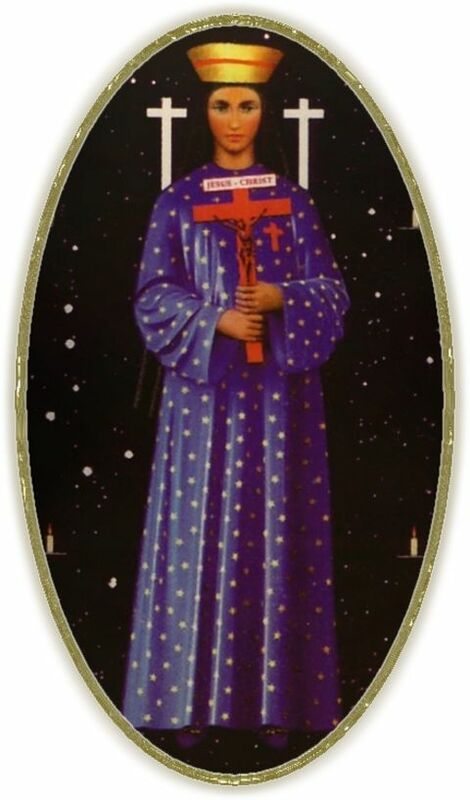 One of them, Comte de la Ferronays, was a devout, but seriously ill, Catholic, who offered his life for the conversion of this young Jew. 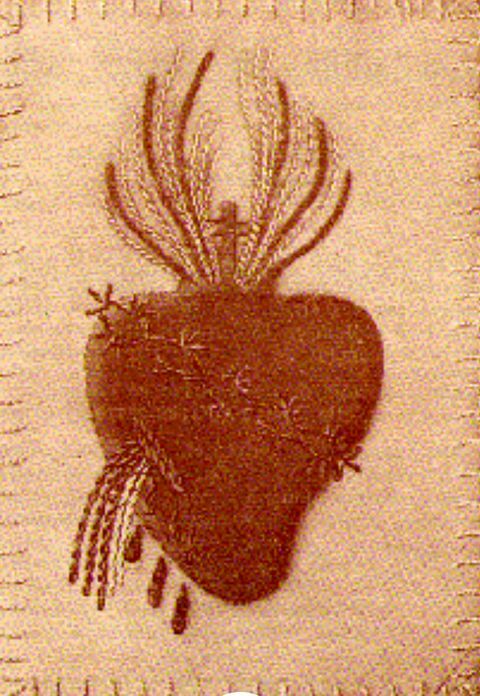 On that same day Comte entered the church and prayed 20 Memorares, then suffered a heart attack and died. 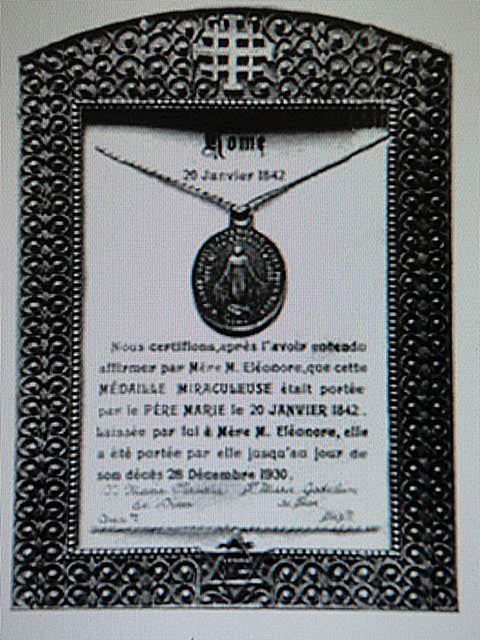 Although Ratisbonne was ready to return the medal and leave Rome, the Baron asked Ratisbonne to accompany him the next day to the church while he was making funeral arrangements. 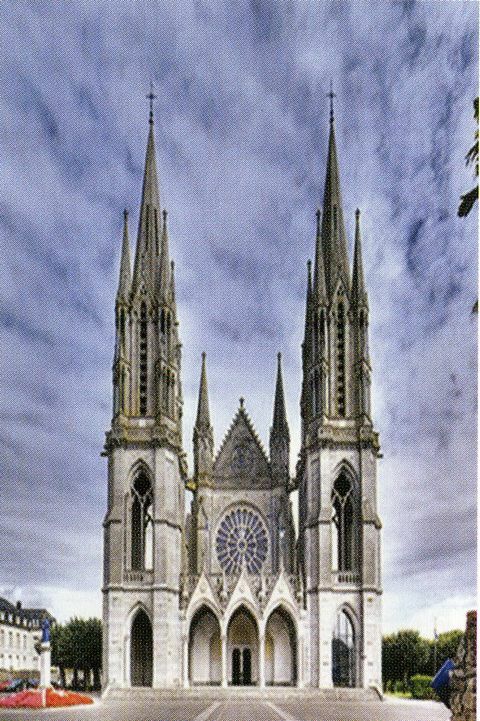 Ratisbonne felt obligated – due to the dead man’s prayers. 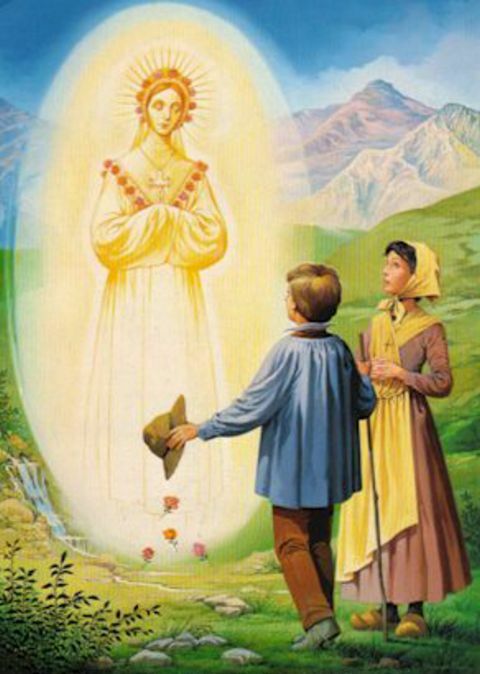 Alphonse is stunned by the unexpected appearance of the Virgin Mary in 1842. 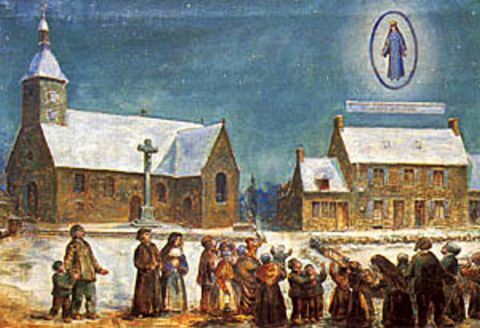 While waiting for Bussieres, he wandered through the church, admiring the beautiful artwork, but then decided to turn to leave out the front door. A huge black dog suddenly appeared and blocked his path. The animal was vicious, baring his fangs. As Ratisbonne froze in his place, unable to move, the dog vanished and a brilliant light began glowing from a side chapel directly in front of him. 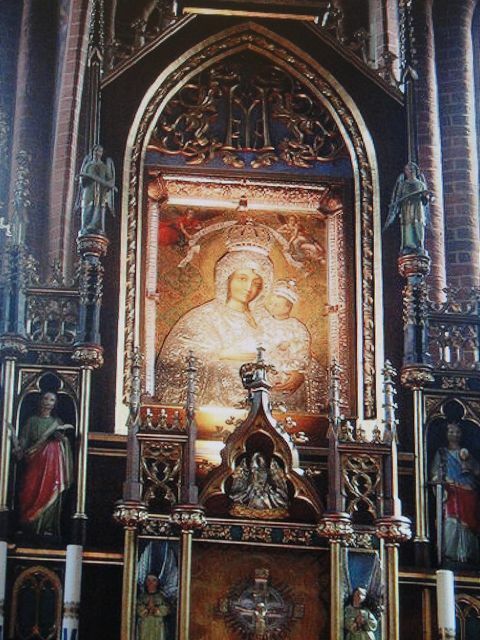 As he stood before the altar dedicated to St. Michael the Archangel, Our Lady suddenly appeared to him (January 20, 1842). She was wearing a crown and a simple long white tunic with a jeweled belt around her waist and blue-green mantle draped over her left shoulder. Her peaceful gaze reached deeply into his soul. Her hands were open, spreading rays of graces. The light coming from her was so brilliant that he had to look away from her enchanting face and captivating eyes. Her height and elegance gave the impression of a great lady, fully conscious of her own dignity. She transmitted both grandeur and mercy in an atmosphere of great peace. 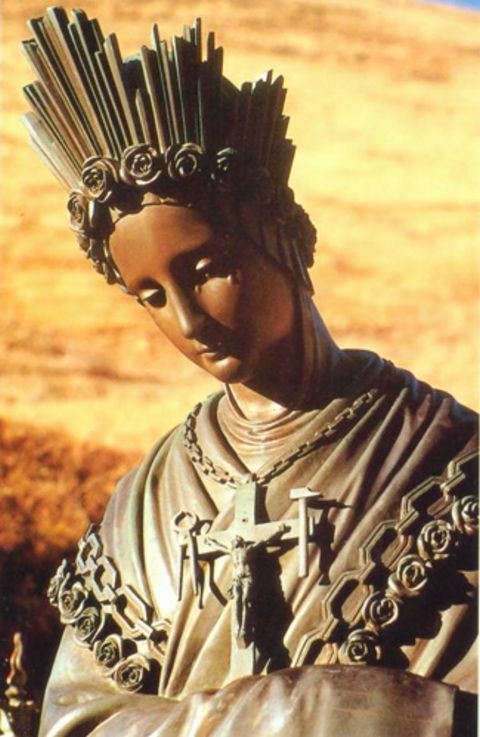 He said that her hands “expressed all the secrets of the Divine Pity.” Ratisbonne understood that he was in the presence of the Mother of God. 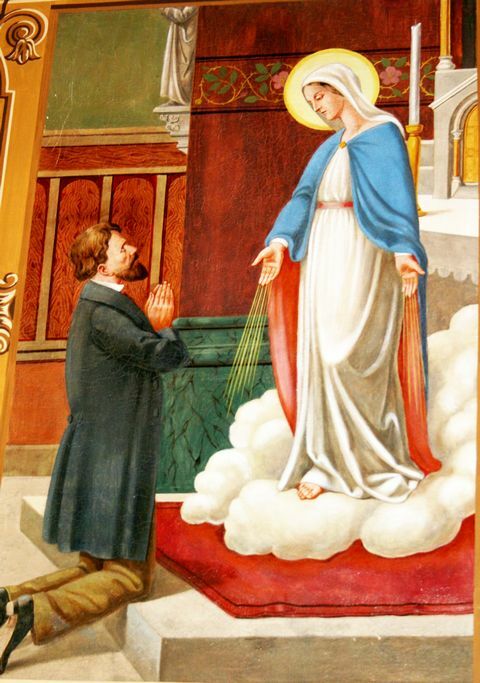 Although Mary never said a word to him, he felt that he “understood all.” He fell to his knees, sobbing, and converted. Official documentation of the miraculous conversion. The Baron was surprised to find him praying fervently on his knees. Ratisbonne immediately asked to go to a confessor so that he could receive Baptism. Eleven days later he received Baptism, Confirmation, and his first Communion. The entire Catholic world became aware of this amazing conversion. Ratisbonne became a Jesuit priest and founded a religious group, the Daughters of Zion – to help with the conversion of Jews!